Australian housing data disappointed, NAB's confidence indexes improved. Downward potential limited by the better performance of equities. The American dollar kept rallying overnight backed by headlines indicating that US Congressional negotiators reached an agreement in principle to avoid another government shutdown this Friday. Such an agreement still needs to be approved by US President Trump, and there were no details about whether lawmakers agreed or not to fund his border wall. Equities were up with the news, but that is just enough to trigger a modest bounce in AUD/USD, which remains subdued below the 0.7100 level. Australian data released at the beginning of the day was mixed, as housing-related figures disappointed big, with Home Loans plummeting 6.1% in December and Investment Lending for Homes declining by 4.4% in the same month. According to the NAB, Business Confidence and Business Conditions improved in January, printing 4 and 7 respectively, lessening the risk of a slowdown in hiring and investment in the upcoming months. However, the report adds that there has been a clear loss of momentum for the business sector, which made the bank say that there's now a greater probability that the RBA will cut rates. The macroeconomic calendar will be mostly light through the European and American sessions, with the most relevant events being BOE's Carney and Fed's Powell speeches. 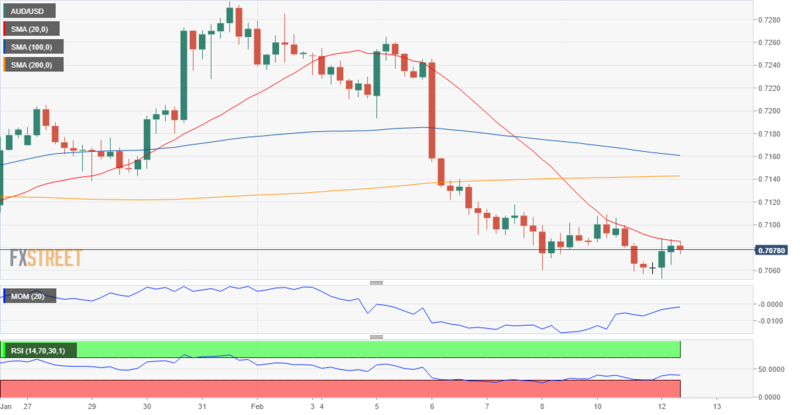 The pair hit a daily low of 0.7053, now struggling with the 0.7080 price zone, with the upside still seen limited despite the better market mood. In the 4 hours chart, the pair is unable to surpass a 20 SMA that lost downward strength but remains below the larger ones. Technical indicators have recovered some ground, with the Momentum aiming higher in neutral territory but the RSI having lost upward strength, now flat around 39, all of which indicates no buying interest around the pair. The bearish case will be firmer on a break below 0.7030, and it will fade on an upward extension beyond 0.7145.